On Saturday, CBP Office of Field Operations (OFO) officers assigned to this Laredo Sector Port of Entry checkpoint observed undisclosed anomalies with a 2017 Dodge Journey at their inspection station. Officers referred the driver, a 22-year-old male Mexican citizen, for a secondary examination. According to the CBP, the unidentified man resided in Nuevo Laredo, Tamaulipas, Mexico. Officers then performed non-intrusive imaging of the SUV and utilized a K-9 officer trained to detect drugs for further inspection. Subsequently, CBP officers discovered 18 packages of the alleged meth hidden inside the vehicle. Authorities determined the bundles weighed a total of 100 pounds and had an estimated street value of $2,201,954. CBP officers arrested the driver, seized the vehicle and the meth, and then, turned the case over to U.S. Immigration and Customs Enforcement – Homeland Security Investigations (ICE-HSI) special agents for further investigation and prosecution. A few weeks ago, the Laredo Sector Border Patrol Colombia-Solidarity International Bridge station confiscated more than $750,000 in illegal narcotics believed to be heroin during a secondary inspection of a 2008 Dodge Grand Caravan hauling a 2018 utility trailer, according to CBP. On January 26, officers found 21 packages of the contraband substance in the trailer during a canine earch and non-intrusive imaging inspection. 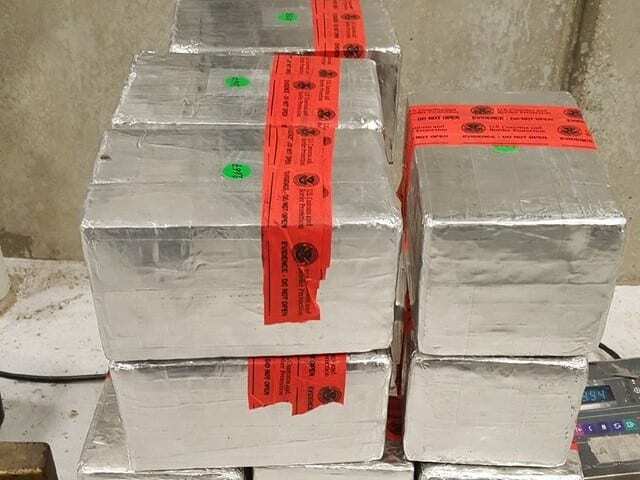 Federal officials said the trailer held 28 pounds of heroin worth approximately $752,400. CBP took custody of the minivan and handed the case over to ICE-HSI for further investigation. In December, Breitbart News reported Laredo Sector Border Patrol agents seized more than $2.3 million in narcotics during checkpoint inspections only days apart. On December 15, agents referred two Mexican nationals, a driver and his passenger, in a Dodge Ram truck for a secondary examination. Officials discovered 14 bundles of suspected drugs wrapped in cellophane and black tape and concealed in the vehicle’s spare tire. The substances tested positive for cocaine and weighed 34 pounds. It held an estimated street value of $1,093,440. Agents arrested the Mexican citizens on drug smuggling charges. Two days earlier, Laredo Sector Border Patrol officers stationed at the Juarez-Lincoln International Bridge apprehended two Mexican women in a Chevrolet Silverado pickup following a secondary inspection in which agents found three sealed buckets in the truck. They contained 94 pounds of meth and estimated to be worth $1,322,848.